Iron Maiden - "Flight 666"
British heavy rock legends, Iron Maiden, in association with EMI Records, Universal (USA) and Arts Alliance Media, announce that they will be releasing a feature length documentary film into cinemas worldwide on April 21st, 2009. 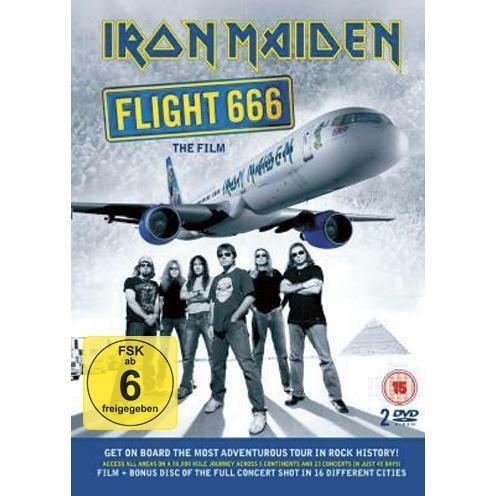 Titled 'IRON MAIDEN: FLIGHT 666', the movie follows the band on the first leg of their “SOMEWHERE BACK IN TIME WORLD TOUR” in February and March of 2008 as they experienced the most ambitious and adventurous tour in rock history. The Maiden tour plan was something that had never been attempted before on such a large scale. Circumnavigating the globe, the band flew in a specially customised Boeing 757 airliner with their crew and 12 tons of music and stage equipment on board, playing 23 sold-out stadium and arena shows in Asia, Australia and North, Central and South America in only 45 days. They played in 13 countries, also landing in Azerbaijan and Papua New Guinea en route for fuel stops, travelling 70,000km and performing to almost half a million fans – a schedule that was only made possible by having their own “magic carpet” enabling them to go where they wanted with all the key elements of band, crew and equipment on the plane, which was christened Ed Force One. Even more remarkable was that the lead singer and Airline Captain Bruce Dickinson was not only in to perform 23 shows, but also to fly the plane on the way. The band were accompanied everywhere by award winning documentary makers Banger Productions from Toronto in Canada, who have received international critical acclaim for their previous movies "Metal, A Headbangers Journey" and recently "Global Metal". Producer/presenter Sam Dunn and his team bring an intimate behind the scenes view of this remarkable journey, with a close look at the logistics involved and following Team Maiden in the cockpit, on the plane and on and offstage, getting to the heart of this innovative global adventure of a band that has very rarely let cameras backstage before. Shot in High Definition, the movie will be screened in 2K digital cinema, with superb 5.1 surround sound, mixed by the bands producer Kevin 'Caveman' Shirley. IRON MAIDEN: FLIGHT 666 brings to the screen all the drama, excitement and hysteria that followed the band around the world every time their Boeing 757 'Ed Force One' landed in a new country. The film documents the intensity of the strict show schedules, the struggle with the time zones, the pressures of ensuring that every performance matched the energy of the many thousands of ecstatic fans from many cultural backgrounds, unusual angles from the spectacular shows......and of course the fun had on the way!. Iron Maiden: Flight 666 is an honest and revealing portrait of one of the world's most successful rock bands, a must see for their millions of fans around the world and anyone else with an interest in Rock Music and World Tours, giving an inspirational account of the chaotic and often humorous world of a band touring the four corners of the world in the most extraordinary of ways.